Customer segmentation is one of the most important techniques companies use to get in control of profits. Segmentation identifies customers you really want, and customer you really want to avoid. In the hands of a good team, it’s a powerful tool that shifts the balance between money-making and money-losing accounts and activities, rapidly increasing cash-flow and profit rates. However, you need a system like WayPoint to do it right, because segmentation must be done by profit value, which means you have to have a system that calculates on-going real-time costs on all your customers. WayPoint closes the loop by doing the segmentation and providing detailed reports your team can use to focus on the accounts that really make you money. This is the secret of our clients who have profit rates several times that of the industry. High-Leverage Accounts (HLA) — These are high-volume accounts that generate net profit rates much greater than your other customers. They’re the best accounts for sales penetration programs, because incremental sales increases increase both profits, and the company’s overall profit rate. They typically represent around 4% of the market. 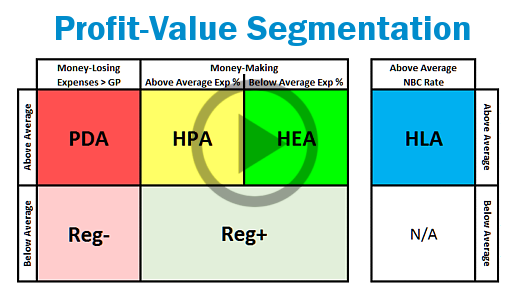 High-Efficiency Accounts (HEA) — This customer segment is comprised of the high-volume accounts that have below-average cost structures, and this makes them the best customers for growth. Adding new accounts of this type increases cash-flow and profits faster than it increases expenses, rapidly increasing both profits and profit rates without increasing personnel or operating costs. HLAs are the top target for your sales team. They usually represent roughly 5% of the market. Profit-Drain Accounts (PDA) — Accounts in this group are significant money-losers — they consume more in your resources than their gross profit can pay for, effectively spending profits you’ve already made on other customers. The more customers you have in this group, the more challenges you face in trying to even maintain your historic profit levels. Companies with a collection of customers in this category are usually feeling "margin pressure" or "cost issues", and can’t seem to get back to previous profit levels. Ideally, this group should represent 0%. 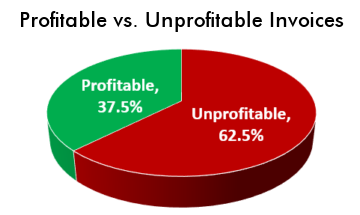 If you have 5% or more, profits will be severely curtailed. Acting on customer segmentation is a straightforward way to directly control your company’s profit rates, but correctly segmenting the accounts takes a high level of sophistication, and on-going dynamic computations. That’s where WayPoint shines — it produces high-quality segmentation reports for any portion of your business in seconds. Our clients think WayPoint’s dynamic customer segmentation is one of capabilities they value most. "By using WayPoint Analytics, and the support from the team they’ve assembled, we have nearly doubled our sales and have increased our net profits to nearly three times the industry average."